The thickening of the womb is medically referred to as endometrial hyperplasia and is sometimes called thickening of the uterus lining. The condition is caused by an overgrowth of cells that line a woman's womb. Any woman at any age can be affected by it and when it happens they worry it might be a sign of a serious condition. They even worry if it might be the start of cancer. That is why it is important to know the facts about thickening of the womb. Endometrial hyperplasia is a natural and normal occurrence for women in their premenopausal period of life. The thickening of the womb occurs as the endometrium lining of the uterus changes every month. In sexually mature females, it grows and thickens in tune with a woman's hormones, which corresponds to a woman's menstrual cycle. Estrogen and progesterone are the hormones that affect the uterine lining. Estrogen causes it to thicken and progesterone keeps the growth in check. The lining sheds after ovulation occurs and the egg is not fertilized. The thickened lining is released through menstrual bleeding. Are There Any Symptoms to Look Out For? If a woman is still in her childbearing years, the treatment of choice is medications. Most often, hormone releasing contraceptives are prescribed. This would include birth control pills, a birth control patch or an intrauterine device. The preferred treatment for peri-menopausal and menopausal women is a round of hormone replacement therapy, which is made up of progesterone. However, this type of treatment does carry with a risk of developing breast cancer or cardiac conditions. The benefits and risks should be discussed with a physician before onset. If medical treatment does not work or is not an option, then a woman's uterus should be surgically removed. This procedure is called a hysterectomy. Most of the time, the thickening of the uterus is normal. However, several factors like stress, certain health issues and unhealthy lifestyle choices can trigger problems. When a woman's menstrual cycle becomes irregular, it can be a sign that there is something wrong in the uterus. When this occurs, endometrial cells may accumulate, which causes thickening of the womb. What Are the Risks of Womb Cancer? The thickening of the uterus is not cancerous in itself. Unfortunately, some women can develop womb cancer when it occurs. 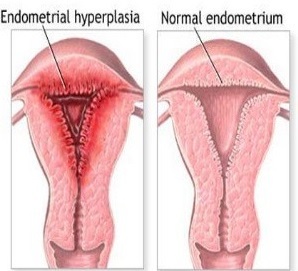 With this in mind, endometrial hyperplasia is categorized into two types: hyperplasia without atypical changes and hyperplasia with atypical changes. When cells have changed and are abnormal, it is considered as atypical changes. When this happens, a woman has greater risk of developing womb cancer. Up to 20% of women with endometrial hyperplasia will develop this type of cancer. If they are diagnosed with atypical hyperplasia after menopause, the risk is even higher. Hormones off balance – When the estrogen and progesterone levels in your body are off balance, it can cause changes in the lining of your uterus. When the amount of estrogen released causes it to be higher than your progesterone level, you may be at a higher risk to developing cancer. Conditions that may cause the thickening of the womb include obesity, polycystic ovary syndrome, diabetes, some hormone therapy medications and a rare type of ovarian tumor that increases estrogen levels. Early onset of menstruation – Women who started having their menstruation before the age of 12 are at a greater risk of endometrial cancer. With every cycle, your endometrium is exposed to more estrogen. No pregnancies – For women who have never been pregnant, their chances of developing endometrial cancer is higher than women who have been pregnant at least once. Age – The risk of endometrial cancer rises as a woman gets older. Older women who have gone through menopause have the highest occurrence of this disease. Obesity – When you are obese, your body cannot maintain proper hormone levels. This increases your chances of developing womb cancer. Hereditary nonpolyposis colorectal cancer syndrome – This condition is passed through a gene mutation, carried from parent to child. If you suffer from this syndrome, it is important you discuss ongoing screening with your doctor. Breast cancer hormone therapy – When diagnosed with breast cancer, women often take tamoxifen, a hormone therapy drug. Tamoxifen increases a woman's chance of developing endometrial cancer but for the most part its benefits outweigh the small risk. Two Months Without Having Period, Why? Period Lasted Only Two Days, Why?